Meta-analysis, literally the statistical analysis of statistical analyses, describes a set of procedures for systematically reviewing the research examining a particular effect and combining the results of independent studies to estimate the population effect size. By pooling study-specific estimates of a common effect size and adjusting those estimates for sampling and measurement error, a meta-analyst can generate a weighted mean estimate of the effect size that normally reflects the true population effect size more accurately than any of the individual estimates on which it is based. To reduce the effects of measurement error, estimates are sometimes adjusted by dividing each study’s effect size by the square root of the reliability of the measure(s) used in that study (usually the Cronbach’s alpha). Estimates obtained from less reliable measures are thus adjusted upwards to compensate. There are at least three reasons for doing a meta-analysis. Can you give me three good reasons for doing a meta-analysis? 1. Meta-analysis is a superior alternative to the narrative review when reviewing past research. At best, a narrative review may be able to inform a conclusion about the direction of an effect. But a meta-analysis will provide you with a point estimate of the effect size and a confidence interval quantifying the precision of the estimate. Meta-analysis will normally permit you to reach a conclusion even when the underlying data come from dissimilar studies reporting conflicting conclusions. 2. A prospective power analysis will help you determine your target sample size, but a power analysis is only as valid as the estimate of the anticipated effect size on which it is based. A meta-analytic review of past research will often be the best way for informing expectations about likely effect sizes. 3. Meta-analysis can be used to test hypotheses that are too big to be tested at the level of an individual study. For example, a meta-analysis may examine the effects of contextual moderators such different research settings. A meta-analysis can thus signal promising directions for further theoretical development. Meta-analysis seems complicated and I’m an old dog. Why are you so convinced I can learn this new trick? I used to teach PhD students with zero experience how to do a meta-analysis in a single class. Admittedly it was a three hour class, but by the end of it students were doing meta-analysis all on their own with no problems at all. Meta-analysis is conceptually easy. It will take you about 2 minutes to follow my simple example found here. It’s true that not everyone will want to run a full-blown meta-analysis. But learning to think meta-analytically is an essential skill for any researcher engaged in replication research, theoretical development or who is simply trying to draw conclusions from past work. 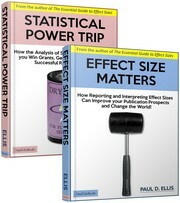 For more, see The Essential Guide to Effect Sizes, chapter 5. You are currently browsing the archives for the meta-analysis category.